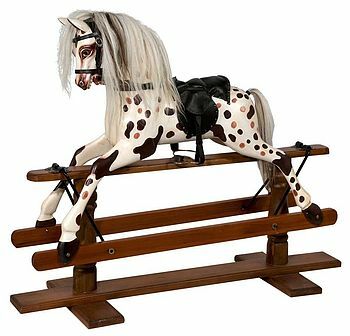 Rocking horse – the bigger ones are very expensive but they are the kind of heirloom that will be passed down for generations. I love this one from NotOnTheHighStreet as it reminds me of a hospital rocking horse I played with a lot, but there are lots of antique rocking horses and more reasonably priced traditional rocking horses on Ebay. 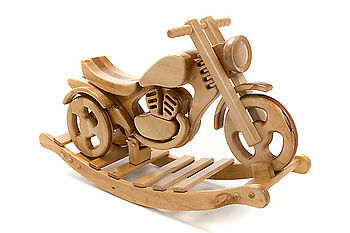 For a more contemporary option, this rocking motorbike is also a sturdy ride-on! Skittles – there are skittle sets for every pocket and they’ll all provide hours of fun. Great on hard floors as little ones love to hear them clatter to the ground. Sand table – It may be winter now, but you don’t just have to buy indoor toys. You can buy basic plastic sand tables for Â£20-Â£30 but I think this Sand and Water Picnic table is much better value – use with the lid on as a garden bench! Trike with handle – Unlike the smaller, pushalong ride-ons, these can be pedalled by kids with longer legs, so are a great choice for taller or older toddlers. Word to the wise: You’ll want a parent handle at a sensible height with a comfortable grip – if possible look for one with a decent sized basket or trailer. They’re a great alternative to a buggy and even better if you can put your bag in the back! My picks? The Little Tikes 3-in-1 Trike and Smart Trikes are expensive for a reason as they has everything you could wish for, but this Bentley Kids version looks equally good at half the price! Keyboard / piano – my daughter has been coveting this keyboard and stool for about a year now but we’ve promised ourselves to buy less space hungry presents this year. The ELC mini keyboards are half price at the moment, so great value! Try to find one with at least 8 keys (an octave) so that they can start to play tunes they recognise. Dolls pram / pushchair – Whether a basic buggy or a posh pram, this will get toddlers walking independently and is a lovely present for soon-to-be big brothers and sisters. I personally favour prams as it means I don’t always have to carry the shopping home… but fold down buggies are good for popping in the boot of the car, or hanging on the handles of the full-sized pushchair when little one gets tired. Duplo – Lego and Duplo are wonderful toys for dexterity and coordination and they really stretch the imagination. They’re also really soothing for adults to play with or “supervise”. Kids Table & Chair Set – Endlessly useful, but try to get 2 chairs to save arguments with friends. Check out Poundstretcher for plastic sets in multiple colours. 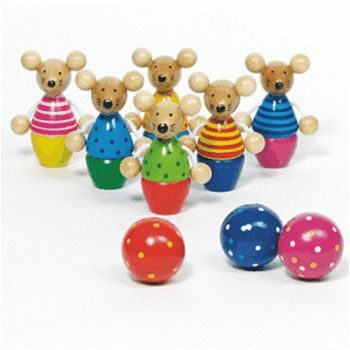 Roleplay Toys – a lot of the roleplay toys which little ones love to play with contain small parts which can be a choke hazard for under threes. These sets are designed to be safe for little ones, but won’t seem babyish as they grow up. 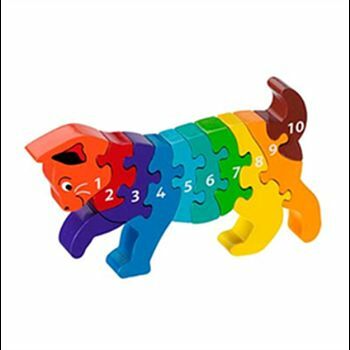 Jigsaws – always a winner, but check with the parents what size / type of jigsaws their child is doing already and try to buy a step up. Dexterity varies massively at this age as they all learn things in different orders! It’s hard to beat ELC for lift out puzzles but look out for puzzles with noise or tactile puzzles. There are some gorgeous shaped puzzles around too. And last but not least… Bags – Toddlers adore bags and can spend hours taking things in and out of them and carrying them around. They are the new, exciting, upgraded model of last year’s hit present, “the box”. We really liked the Little Life DaySacks. Available in Ladybirds, BumbleBees, Sharks, Dinosaurs and lots more, kids wear them happily, they have practical little rain hoods tucked away inside, and they have both a rein attachment and a grab handle which means they can keep both hands free and you can hold onto them tight in those moments when their independence starts to cause panic rather than pride. Lots more gift inspiration coming soon! Writing about the breastfeeding baby doll at the weekend has kickstarted me into Christmas Gift mode. We’ve been so lucky that friends and family have put so much thought into presents for small one so this is a guide to the preschool toys and gifts we’ve bought and have been given that have really stood the test of time. Tactile books – Always make sure they aren’t just touchy-feely on the front cover as some expensive ones are disappointing. Priddy cloth books are reliable for having fun textures throughout. Bath toys â€“ from stacking cups and rubber ducks to the most elaborate water toys, these will be played with over and over again. “Grown up” gifts – Little ones love to play with mummy and daddy’s car keys and mobile phone. While they’ll still make a beeline for the real thing, these might distract them while you make a phonecall, drive or put your makeup on. If the brightly coloured phone doesn’t fool them, John Lewis sell a baby smartphone! Baby toys that last for years – the simplest gifts often give the most pleasure and my now extremely grown up three year old and her nearly teenage sister still enjoy building towers (and now whole cities) from basic bricks. Tomy Hide & Squeak Eggs are another great buy – they are endlessly fascinating for babies and make great “dippy eggs” for cooking as they get older.Traditional peg and hammer toys become “work benches” for older kids. NB. Remove small bricks when giving to under threes (anything smaller than an old style film canister is a potential choke hazard). 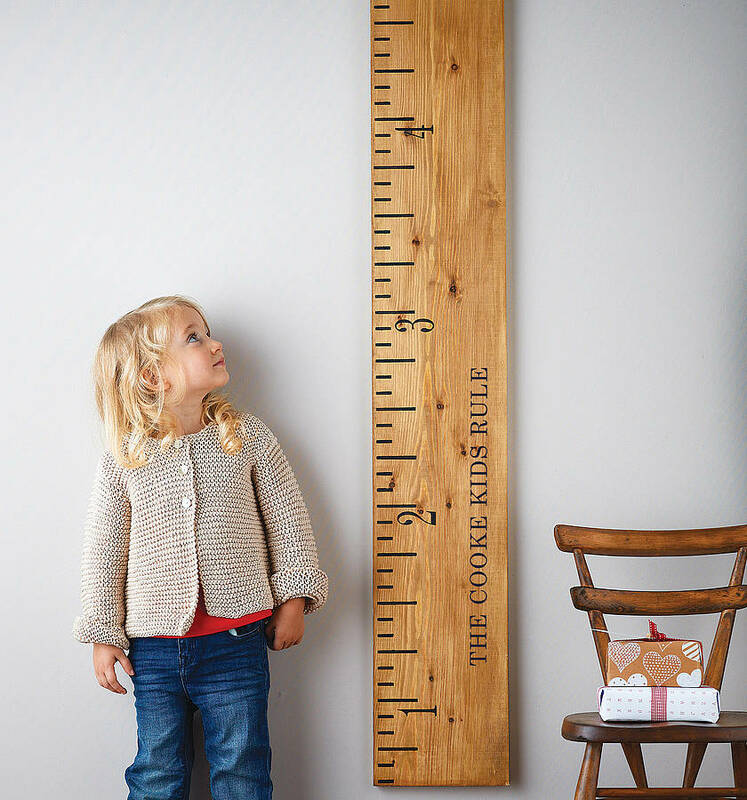 Things Mum and Dad will want – If the house has been overrun by baby toys, a toy box will be appreciated by everyone and height charts are a lovely way to keep records. Baby Walkers – There are lots of versions available but look for something that doesn’t topple over when leant on. The V-tech baby walker is probably the most popular (the button panel can be unclipped used separately) but the new ELC walker and the BigJigs wooden walker both look brilliant! My daughter played with her walker / phone / computer / spaceship until quite recently despite walking before her 1st birthday. More gift ideas for the rest of the family later this week!